Whether our own mothers are still with us or not, my guess is that a bunch of people my age and older feel like they lost a woman today who felt a little like their own mothers, or at the very least someone who they wished their own mothers could be. 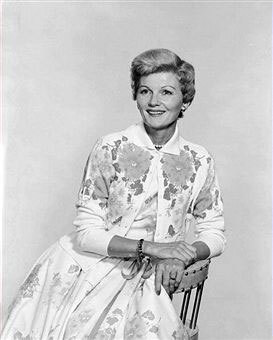 Barbara Billingsley, known the world over as June Cleaver, loyal, loving wife to Ward, doting, stern, occasionally indulgent, always wise mother to Wally and the Beaver, died this morning in Santa Monica at age 94. In Leave It to Beaver she managed to personify the model ideal of the hard-working housewife of the 1950s. Yet her portrayal, which began with the way the part was written and then fleshed out by her no-nonsense, open-faced appeal and refusal to turn her character into a caricature or an exaggeration for comic effect, ended up exemplifying the standard for a certain stripe of motherhood—TV sitcom variety and, to an extent, the real thing—for several generations who were too young to have ever seen the show’s original run. She knew when indulgence and understanding were called for as well as punishment or stern insistence on her authority, and she made her love clear to her boys without ever feeling as though she had to pretend to be their friend in order to do so. June was more than a friend to her boys; she was the one person, in concert with Ward, who knew them well enough to guide them without guilt or deception, but with honesty, and with the ability to admit that even June and Ward could, on occasion, use some guidance themselves. Billingsley was a talented actress who began her career working diligently in TV and movies in 1945, and though she made her mark as June Cleaver, she worked infrequently after the run of that series stopped in 1963. Whenever she appeared in movies or TV after that, it always seemed to be in a capacity that directly drew on memories of her work on Leave It to Beaver. And though she worked occasionally in films for 12 years before her big role, she never made a memorable appearance in a movie… until the summer of 1980, when she took a small part in a grab-bag parody of disaster movies called Airplane and, in the most improbable move of her entire career, got one of the biggest laughs in a movie not lacking in gut-busting moments. The memory of who June Cleaver was and what she represented may be even more relevant than we sophisticated denizens of the 21st century, with our multiple volumes of Baby Mozart CDs and how-to manuals on every stage of parenting, from cradle to college, may ever care to admit. When we contemplate June’s love for her sons and her common-sense approach to life, we do so knowing full well that the world of the Cleavers was one based in fantasy. Even so, and even when we know that June Cleaver is an icon grounded in an era of conformity and plasticity and ignorance of the multicultural contributions just waiting to be made to society, the image given to her by Barbara Billingsley can be accessed without nostalgia as one to follow in caring for and listening to our own children and the world around them, one which is so different than the one which occupied Wally and the Beav. I didn’t know you, Ms. Billingsley, but I surely did love June Cleaver, and it’s so nice to know that even though you’re gone now, after having lived what one can only hope was a wonderful life, you’ve left us with the lasting impression of good parenting. And look'ere, chump bes' bleeve mama c'speak jive li'a mofo. She was so lovable! I enjoyed this post a lot, and the clips, too.